A Webkinz Cake is must at the Webkinz Party - a fun and favorite kid party idea! This one is cute and easy! This design celebrates the colorful logo and is very fast and easy to make. 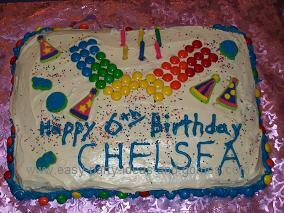 It is actually from my daughter's 6th birthday party. She designed it, and then actually put the m&M's and candy pieces out on the cake. Start with a cooled cake in whatever shape you prefer. Ice the cake in whatever color you wish (we used white to make the other colors stand out!). Use M&M's to decorate the shape of a "W" so that it has a rainbow effect like in the photo. Hint: Designing the placing of the M&M's takes a little trial and error to make it look just right. Practice on a plate before you put them on the cake. Pipe your favorite color around the bottom, and then place M&M's on top of this piping for added color. We also added candy shapes (from the cake decorating department at the grocery store) to our decoration. 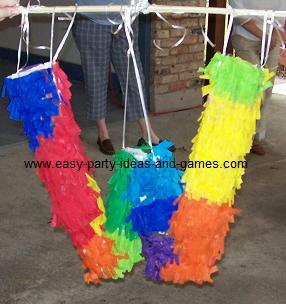 Read all about the games, decorations and more at our Webkinz Party.